By XLabz Technologies Pvt. Ltd. Developer: XLabz Technologies Pvt. Ltd.
Did you know that your brain generates 10 to 23 watts of power while you're awake? That's enough energy to turn on a light bulb! Curious to find out your Brain Power and exercise your brain? Then get ready to fire up those neurons with Who Got Brains! 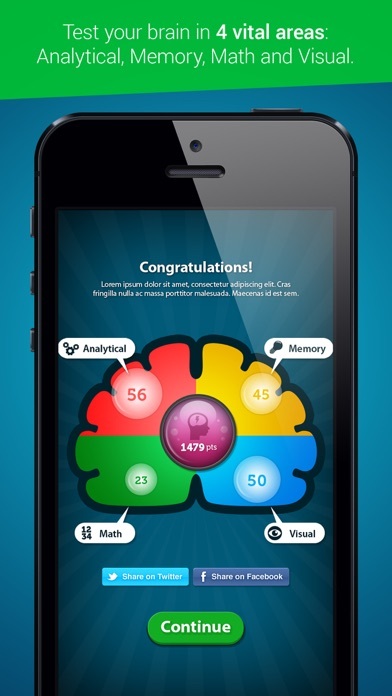 Who Got Brains is a mind game designed to test your brain in 4 key areas: Analytical, Memory, Math and Visual. It takes you through a series of mini-games which will have you racing against the clock to complete them! So you get to play a bunch of fun games and keep your brain sharp and active at the same time! Doubly awesome, right? 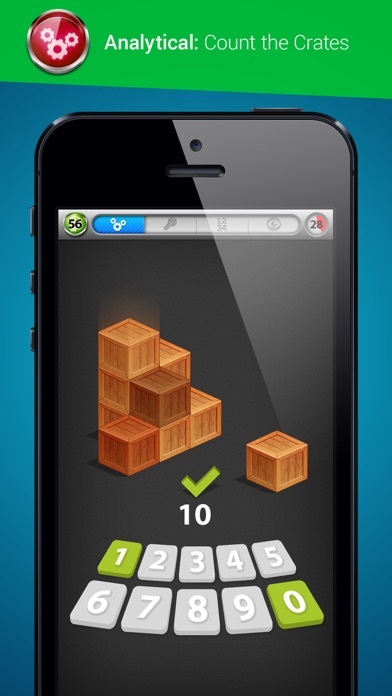 GAME FEATURES: - A series of rapid-fire games that test your cognitive abilities. Challenge and stimulate your brain with a variety of brain teasers in 4 key categories: Analytical, Memory, Math & Visual. 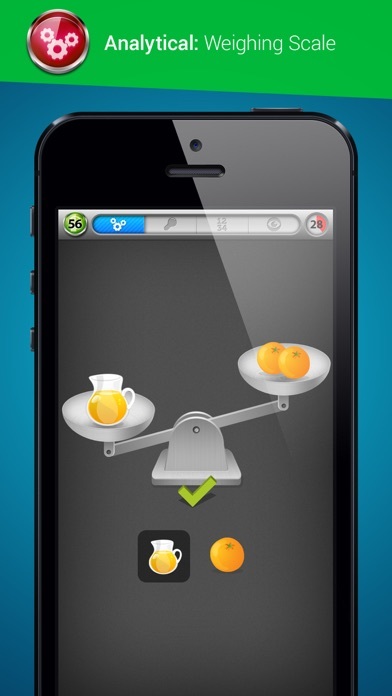 - The scores from each category are summed up to give you an overall rating- your Brain Power! - Login with Facebook to see your rank on the local and global Leaderboards. Compare your Brain Power with friends and see where you stand amongst them. - Invite your Facebook friends to play and challenge them to beat your score! - Share your best achievements on Facebook & Twitter. And hey! If you're not too happy with your scores, just keep playing! The more you play Who Got Brains; the higher you score on the mini games, the higher your Brain Power becomes. Nothing like a brain training game to keep your brain charged, yeah? Not just that, brain games are proven to keep diseases like Alzheimer's at bay. So keep your brain cells healthy and strong with Who Got Brains. So, all set to pump up those grey cells? And find out who has the biggest brain among your buddies? 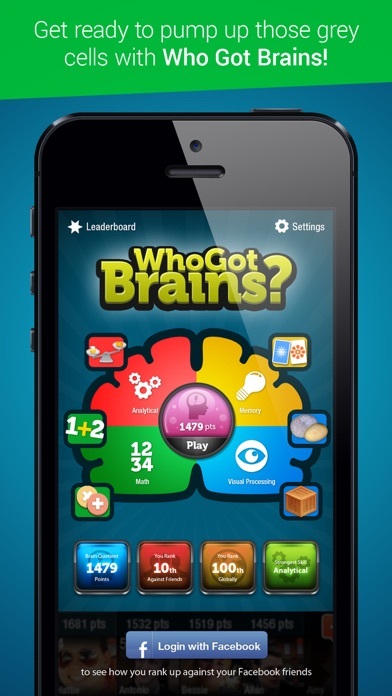 Play Who Got Brains now and get your daily dose of Brain Power!! Fans of Who Has The Biggest Brain?, Brain Challenge, Dr Kawashima's Brain Training and the like, will love this one! If eellike my brain is getting a challenge, but I wish I could see how many people are ranked so I know where I fall. Just saying you are 150th or whatever doesn't mean much if there are only 200 people playing! Or I don't have any patience. It just keeps going! No timer to run out! AND longer problems (inside parenthesis) don't resize or rotate making them impossible to solve. Please fix and update! Same puzzles over and over. The app is really addicting to try and beat your highest score. The only the stopping from rating this five stars is that you play the exact same things each time. Only the visual category has two options to play on. I would totally rate this five stars if the makers would make many more options for each of the four categories. Other than that, I love the app. Enjoy brain challenges! Keep adding more puzzles. Great game, I enjoy it a lot. 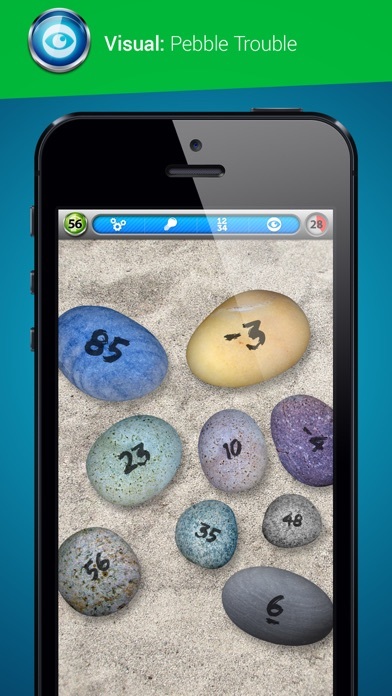 If you like brain training games then this is for you. Logo Quiz Game - Guess Brands!